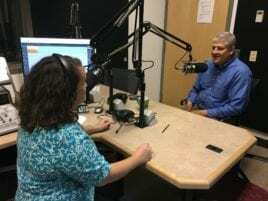 Dr. Clive Lipchin, director of the Arava Institute’s Center for Transboundary Water Management, is interviewed on WPSU, Pennsylvania State University’s affiliate of National Public Radio. From Israel to Pennsylvania, water resources are precious and must be protected. During a recent trip to the US, Dr. Clive Lipchin, Director of the Arava Institute’s Center of Transboundary Water Management, connected with students and faculty at Pennsylvania State University and shared insights that can help their communities work through critical issues related to local water management. On October 17th and 18th, Dr. Lipchin spoke to a variety of staff, faculty, and students about the ongoing water scarcity crisis in Israel, Palestine, and Jordan. Dr. Lipchin discussed the current work of his research center, including the recent USAID-funded initiative to install local greywater treatment plants in underserved Palestinian communities throughout the West Bank. During the lecture, Dr. Lipchin gave an overview of the transboundary issues facing the Arava region and the greater Middle East. Later in the afternoon, he spoke and provided insights during a master class aimed at bringing together local water professionals and officials to discuss regional water cooperation. In total, more than 150 members of the Penn State and State College, PA communities attended the events. For more information on the Arava Institute’s visit to Penn State, please contact Ari Massefski.